Vidhya, I know so many recipes using beans. I have cooked them also but somehow, the taste of beans is not accepted by my system. But, I will sure try out this south Indian style of cooking beans. May be I will like it. oh this is a cookery blog uh? well then i will be visiting often. Finally you came up with beans curry. That sounds nice. Keep updating. it will be useful for me. 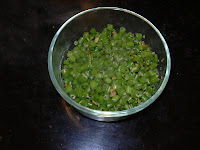 Hi Sangeetha, I have 4 kinds of Curries using Beans. Try each one of them. I will be happy if u like my way of making beans.